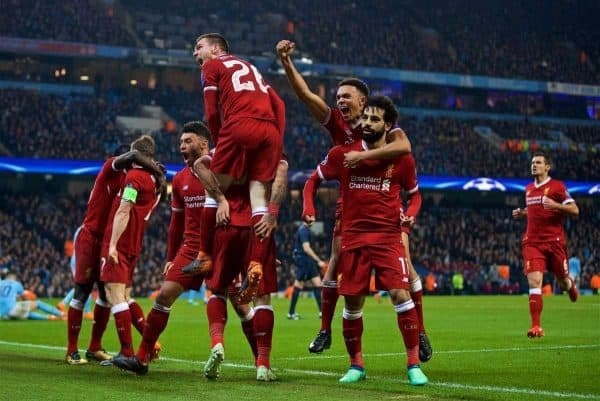 Liverpool booked their place in the semi-finals of the Champions League with a historic 5-1 aggregate victory over Man City on Tuesday night. After recording a dominating 3-0 victory at Anfield, Liverpool went into the second leg as huge favourites. But it took just two minutes for Gabriel Jesus to break the deadlock and give City the lead. City then controlled the first half and had a number of chances to score but Liverpool held on to their two-goal aggregate lead. They continued their pressure in the second half but Sadio Mane and Mohamed Salah linked up to score midway through the second half. Liverpool then controlled the final 20 minutes and Roberto Firmino sealed the deal as they booked their place in the semi-final of the Champions League for the first time in a decade. Up there with the most harrowing halves of football I've ever watched. Lucky to be 1-0, but if big improvements aren't made, Liverpool are heading out here. Huge team talk required from Klopp – the players have frozen. So much great about that goal. Gini having an excellent half, brilliant pass from Ox to find Salah, Mane bold moving into the box and then Salah's finish…? We've just beaten the team home and away that the bookmakers had ordained tournament favourites not two weeks ago. – Ramin Naumoth on the forums. Liverpool’s composure over the two legs was so impressive. City are brillIant but we handled what they threw at us & picked them off. Everyone slates him when he has a bad game, but Dejan Lovren was absolutely immense tonight. Deserves enormous credit for stepping up like that in the biggest game of his career. James Milner was absolutely heroic in that performance. He covered every blade of grass and was pivotal in closing City down when others started to drop back. Virgil van Dijk worth every penny. – Abyss on the forums. Liverpool Football Club. European Royalty ? – David Finch on Facebook. We’re in the Semi Finals!!!! – AP on the forums. Champions league semi final, brilliant! ? – Red One on the forums. YESSSSSSSSSSSSS!!!! GET IN THERE!!!!!!!! YNWA!!!! Incredible performance in both legs. Balls like grapefruits from the lads tonight. Just really proud of each and every one of them. GET IN!!! ? @LFC @ChampionsLeague ????? ?